Figure 8.6.7 shows the Zarchin-Colt process in which water is the refrigerant. Seawater, after prechilling in a heat exchanger to a temperature approaching the freezing point of brine, enters the freezer. Evaporation is induced by the suction of the compressor, which absorbs heat from the remaining brine. Ice crystals are formed, growing to about 0.5 mm. The ice-brine slurry is pumped to the ice decanter where ice crystals float to the top. There they are washed with a portion of the product water made. This washwa-ter moves downward and carries away salt. 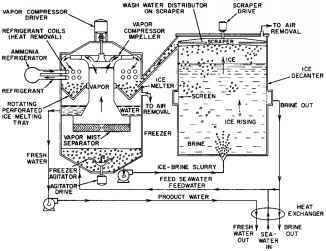 A rotating scraper trims the ice layer at the top and sends the washed crystals to the freezer, where they come into contact with the compressed water vapors. The water vapor condenses on the ice crystals suspended on a rotating perforated tray and melts them. (The ammonia refrigeration system shown in Figure 8.6.7 removes heat gain through insulation.) This melted ice is the desired fresh-water product. The cold fresh water and cold brine from the ice decanter are routed through a heat exchange unit to chill the incoming sea-water. This process was successfully operated in a 100,000 gpd pilot plant. The total power cost is estimated, for an improved operation, to be as low as 27.3 kwh per 1,000 gal in a combination of 21/2 million gpd units. FIG. 8.6.7 Zarchin-Colt freezing process for seawater desalting. limits the size of a single unit to about 200,000 gpd. Larger capacity plants must consist of duplicate units. To circumvent this, a process was developed involving a secondary refrigerant. Instead of water vapor, a refrigerant such as butane, which has a vapor pressure above atmospheric at the freezing temperature of brine, is used. Liquid butane is mixed with the brine in the freezer and, after absorbing the heat of ice fusion, it vaporizes. After compression, the butane vapor is used to melt the ice crystals. However, this development work was terminated because projected costs for commercial plants were no lower than costs for evaporation. In this process, water from a salt solution is forced across a selectively permeable membrane by a pressure difference. The membranes allow water to pass through but not salt ions. The pressure applied must be greater than osmotic pressure. The osmotic pressure in a freshwater-salt water system separated by a selectively permeable membrane is a direct function of salt concentration: about 25 atm for sea water and 1.4 atm for brackish water with 2,000 ppm solids. Figure 8.6.8 shows a typical reverse osmosis system. Salt water is first pumped through a filter to remove gross particles and iron, and then it is subjected to additional pretreatment as required to prevent fouling of the membrane surface. 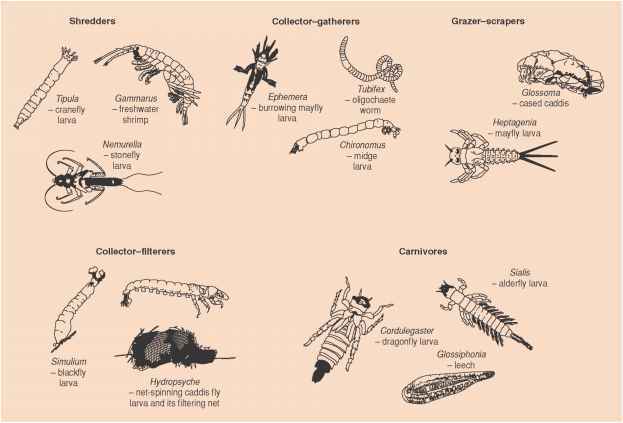 Some examples of brackish water pretreat-ment include lime-soda treatment or the addition of sequestering agents to prevent calcium precipitation. The salt water is then pressurized to a level high enough to reverse normal osmotic pressure and to provide driving force across the system, including the membrane. The salt water is fed into reverse osmosis cells (modules). Part of the water permeates the membrane and is collected as fresh water. The remainder (brine) passes through a turbine for recovery of power before it is rejected. Figure 8.6.9 shows a spiral-wound reverse osmosis module. The module contains spacers, modified cellulose acetate membrane, and a porous backing in a spirally wrapped double sandwich. 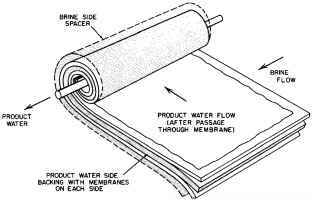 Brine flows across the membrane sheets while the product water flows toward the center of the wrap and out the unit's core. Another promising membrane configuration involves the use of fine hollow fibers. FIG. 8.6.8 Reverse osmosis for seawater desalting. FIG. 8.6.9 Spiral membrane module for a reverse osmosis unit. hinges on the reduction of membrane replacement costs, a major item in total water cost. The objective is either reducing basic membrane cost or extending service life. A large part of the present work on reverse osmosis is directed toward increasing product-water flux while maintaining salt properties (Browning 1970). Electrodialysis is based on the development of membranes that are selective for the passage of ions of a given charge. Two different membranes are used: one is more selective to anions, and the other is more selective to cations. 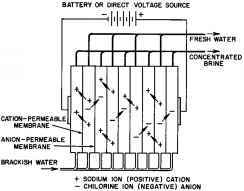 Electric current aids the diffusion of these ions, and the electric energy required is proportional to the concentration of salts in the saline water. Therefore, the process is more attractive for desalting of brackish (low salt concentration) waters. FIG. 8.6.10 Electrodialysis used to remove salt from brackish water. membranes. Thus, the feedstream is depleted while the adjacent stream is enriched in ions. The plant produces a potable water stream and a salt-rich stream which is rejected. Ion-exchange resins, which comprise 60-70% of the membrane, are solidly hydrated, strong electrolytes and might be regarded as solid sulfuric acid or as caustic solid. The resin most commonly used is polystyrene cross-linked with divinylbenzene. The ion-exchange resin permeable to cations is made by sulfonating the polystyrene resins; the resin permeable to anions contains a quaternary ammonium group attached to the polystyrene resin. Electrodialysis is an established process for desalting brackish water. Units with capacities from 10,000 to 650,000 gpd have been installed. The process has major advantages for brackish water but is considered too costly in electric power requirements for desalting seawater. Keeping the membrane surface clean is a major problem. Prefiltering and chemical treatment of feed has kept plants operating, but a thorough study of brine composition should be made and special pretreatment methods should be developed as required. Membrane replacement costs are a major part of producing fresh water by this method. Current research includes studies to improve selectivity of the anionic-permeable and cationic-permeable membranes to increase the maximum allowable current per unit membrane area and to develop feedwater pre-treatment processes for the removal of various membrane-blocking contaminants. Table 8.6.2 summarizes the most favorable feed properties and capacities for each of the six processes described in this section. Processes based on evaporation are operated in large-scale plants for desalting seawater. Out of the several evaporative processes, MSF has been most widely used in very large-scale installations, while VC is commonly used in small-scale plants. Vapor compression with forced circulation evaporators offers the possibility for desalting brackish water. Processes based on semi-permeable membranes are used mainly for desalting brackish water. Electrodialysis is already a well-established process, although reverse osmosis is also feasible. Controlled flash evaporation appears to be an attractive alternative to the MSF process. The most successful evaporative desalting method is the MSF process (Figures 8.6.3 and 8.6.6). These units are built with as many as 69 stages and produce up to 20 lb of water/lb of steam. Research continues to improve the efficiency of this process by flash enhancers and by combining the MSF system with multiple-effect evaporation process steps. Problems common to all desalting processes include the decreasing but still high combined cost of equipment and operation (see Conversion Processes) and the low load factors associated with these plants. The load factor refers to the percentage of time that the plant is in operation, and this seldom exceeds 60% for desalting plants. Low load factors are partially caused by corrosion problems and partially by scaling problems. For seawater, scaling becomes a problem at 160°F, although methods have been developed to control scaling at temperatures as high as 350°F. In addition to maintenance problems, scaling also degrades the heat transfer efficiency of heat exchange surfaces.